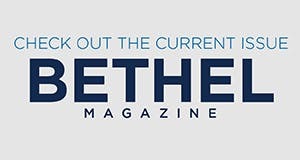 Read the latest publications produced by Bethel University students. The Clarion is your home for news, features, opinions, reviews, and sports at Bethel University. The Clarion is an award-winning, bi-weekly newspaper produced entirely by students for the Bethel Community and does not reflect the views of the institution. It provides a forum for the exchange of information and ideas. Through truthful reporting, it functions as a resource and a voice for the student body it represents. If you have any questions feel free to contact us at clarion@bethel.edu.